Try this yummy recipe this summer with your kids. 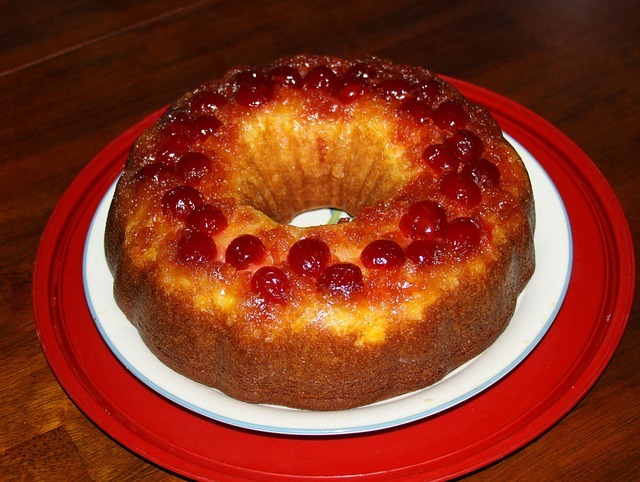 Children love to layer the fruit and see how it turns out after baking and turned upside down. Melt butter and pour into the bottom of a 9x13 cake pan. Mix together brown sugar and cinnamon. Evenly sprinkle mixture over melted butter. Arrange pineapple slices over mixture, one layer deep in pan. Place a cherry in the center of each pineapple slice. Pour cake mix into pan. Bake according to package directions. a serving plate or cake board. Heat oven to 350. Combine brown sugar, butter, cinnamon and nutmeg in a small bowl. Mix well and then spread into bottom of round cake pan. Arrange apple slices and enough Maraschino cherries to fill in the holes of the apple rings over the brown sugar mixture. I put them closely together to get more apple rings all around. Beat egg yolks in a bowl until thick and really yellow. Add sugar and mix well. Add flour, baking powder, salt, and apple juice to egg yolk mixture and mix well. In another small bowl, beat egg whites until stiff peaks form. Fold the beaten egg whites into the batter. Pour batter into prepared pan, covering apples and cherries. Don't worry if you can see some of the cherries sticking through. The cake will rise as it bakes. Bake at 350 for 30 to 35 minutes, until toothpick inserted in center comes out clean. Wait for about 2 minutes and then turn over onto serving plate. Be careful not to burn your fingers. Serve warm. Makes 6 servings but doesn't last long in our house! 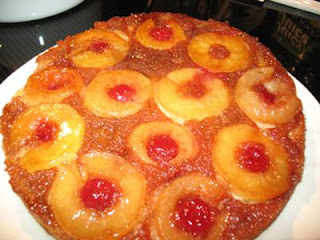 This recipe was adapted from a Pineapple Upside Down Cake recipe in The Pillsbury Cookbook published by Bantam Books. I made my own changes to recreate it as an Apple Upside Down Cake for the fall season.